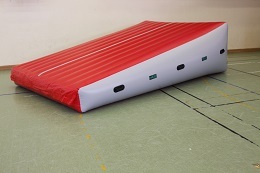 Air4tumble's range offers air equipment in the highest quality. We were very careful when we selected our material, to achieve maximum strength and durability in our products. All our products must be user-friendly and easy to handle. Same rebound as a tumbling track. It's fully airtight and there's no blower requiered during use of the airfloor. Easy to adjust hardness with att gentle press on the valve.For all disciplines: artistic, teamgym, aerobic, cheer, tumbling, acrobatics. 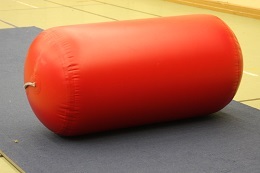 The air cylinder is a simple and yet extremely versatile, multi-purpose training device. It comes with a small foot pump.You can also choose stopper as an option.The air cylinder has many applications for teaching body awareness and control. 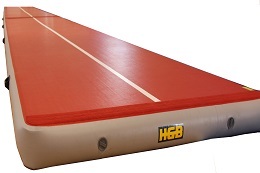 The air4tumble Wedges or “Inclines” are a great training aid for downhill tumbling and for teaching the fundamentals of a back handspring.